Boots No7 Lift & Luminate TRIPLE ACTION Serum 1.69oz. (50ml) NIB! Excellent Ebayer!! A+++++ Thrilled with my purchase! Thank you! Seller A+++ - Super Fast Delivery! I'm very happy with my purchase! Would buy from again. I ordered this serum after asking a 63 year old friend of mine how she has such a nice complexion. She told me that she had been using this Boots #7 for 5 years now, and has been told often that she has nice youthful skin. She also mentioned that she does not use foundation, which I found surprising; most people I know, young and old do wear a foundation. I, myself had just begun doing the same, but did not enjoy having to do this, and felt like people could see the lines left from the make-up. I felt relieved that I could stop using the foundation, and just focus on getting smooth healthy skin without the appearance of deep wrinkles. I immediately searched for the best deal for this "serum", and found a good deal with the 1 1/2 ounce tube. I use it every morning and night, and my skin feels smooth and healthy. I wish I had found this years ago! I used this product morning and evening for 3 days. Unfortunately it irritated my eyes. The skin across the cheek bones became red and burned when cleansing. I was disappointed because the reviews were great. Just not for me. As a horse breeder in the Northeast for 40+ years & former equestrian competitor, training & competing outdoors-regardless of the weather, my skin has taken a beating from every kind of weather imaginable. Over the years, I have tried many different creams & lotions to help the appearance of my sun damaged skin-from the common brands sold in drug stores, to higher end products, despite their super high price points, sold at exclusive stores & boutiques. All to no avail. In the past I would begin using the other products full of hope, but there never seemed to be any sort of positive difference seen or felt & my face felt covered with heavy, greasy gunk, long after its application, even sticking to my pillowcase at night. After a period of hit or miss use, a prelude to those products joining the others in my drawer full of other "hopefuls," that promised what Boots No7 Triple Action Lift & Illuminate provides, but simply did not work for me,.into the junk drawer those went. This is the ritual followed prior to the official dumping of useless jars of facial products into the trash & was becoming too frequent. Then I tried No7 Triple Action Lift & Illuminate & the angels (in my head) sang! For me, the Boots No7 Triple Action Lift & Illuminate products do just as they say & in my case the results were seen, and felt, almost immediately. It has continued to soften my skin while reducing redness and evening the tone of my skin. Boots No7 products work very well on me. After the first time I used No7 Triple Action Lift & Illuminate Serum the very next morning my skin felt softer. Now, after about 3 weeks to a month of using No7 Triple Action Lift & Illuminate Serum, Night Cream & SPF 30 Day Cream my skin no longer feels like leather & many of the especially damaged areas already feel smoother & softer. That in turn seems to diminish the appearance of my deep wrinkles-even without makeup. The products are easy to use, the directions of recommended use well explained, and best of all the No7 Triple Action Lift & Illuminate Day Cream contains a very respectable SPF of 30. Kudos to Boots No7 for offering a variety of anti aging products geared for different age groups and levels of skin damage, to help repair or to prevent damage to the skin. 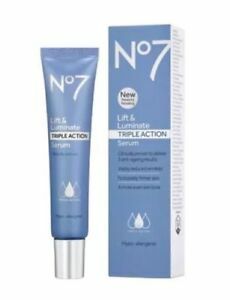 Boots No7 Triple Action Lift & Illuminate product line does just as it says it will for me! Incredible personal results for less money with ebay! I am using the entire skin care line for lift and luminate No 7. I do not use the cleanser at this time. I am 50 yrs old and have very good skin but age was starting to show with some fine lines and frown lines have shown for years. My neck and fine lines have improved tremendously and the deeper frown lines after one month are 50 percent gone. INCREDIBLE STUFF! And buying from ebay saves me quite a bit of money. Although I haven't seen the miraculous results that I was led to believe I would see, I like this product enough to try other No7 products. There is no sticky or greasy feel left behind. It leaves my skin feeling clean and fresh. I have sensitive skin and this product, unlike many I've tried, has caused absolutely no breakouts. As with most good things, less is more. A tiny bit goes a long way, making this a good value.